So Lucky Charms seems to be branching out and offering it's delightful marshmallow-y cereal in a new array of flavors, and I'm left asking, why? The cereal aisle used to be a place where a few unique players offered something that the other varieties didn't. You want fruity? You've got Froot Loops, Trix, Fruity Pebbles, etc. Chocolate lover? There was Cocoa Puffs, Cocoa Pop's, Cocoa Krispies...the lists go on and on. 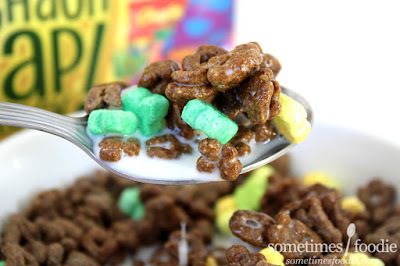 Lucky Charm's niche was marshmallows, and although they weren't completely alone in their offering, with cereals like Marshmallow Alpha-Bits right on their heels, it was pretty much their thing and they did it well. Now-a-days, it seems like each recognizable brand of cereal wants to become a monopoly. Each brand has released a variety within their one label to try and prevent you from straying to other milky pastures. Frosted Flakes is now available in classic, chocolate, with marshmallows, cinnamon sugar, and all kinds of various varieties, and Cheerios has every flavor you could possibly imagine at this point, and now Lucky Charms has thrown their hat into the ring...but I feel like it's not worth it? Chocolate cereal and marshmallows may have been done by a lot of other players, but that is Count Chocula's calling card, and as the sole year-round survivor of the Monster cereal wars (in NJ anyway), I think releasing these Chocolate Lucky Charms is throwing down a gauntlet. Is this any different than my beloved Halloween-tinged cereal? I guess I'll find out. The box is colorful but obnoxious. It's very IN YOUR FACE with large clunky fonts and graphics, which can appeal to kids, but it seems a little...lazy? 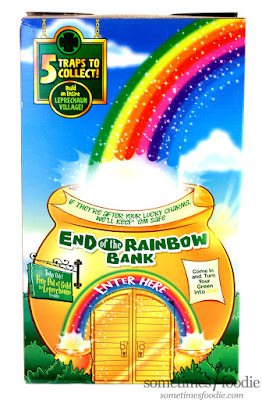 The back of the box is a giant image meant to be used as a Leprechaun trap, which I guess you're supposed to cut out and use to capture a magical Leprechaun on St. Patrick's Day, but all you do is cut the door open. That's it. 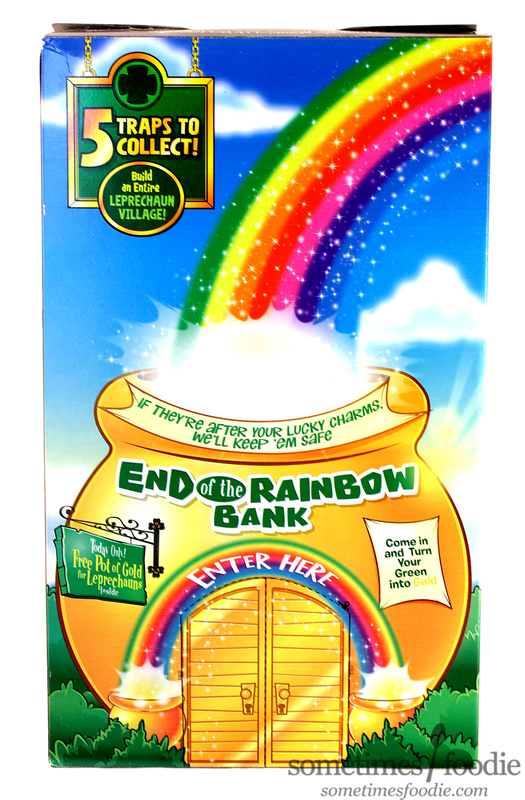 I guess you hide marshmallows inside the door, but compared to previous designs from this same brand for similar seasonal Leprechaun traps, this one seems a bit lazy and uninteresting. I opened up the box and the cereal inside smells sweet and chocolaty, not as chocolaty as a Cocoa Puff, but safely in the recognizable realm of Count Chocula. It's pleasant and alluring, but nothing new or unique. As always, I poured a little cereal into my bowl and tried it dry. Admittedly, this is slightly different from Count Chocula, in that the marshmallows are the same vanilla marshmallows found in Lucky Charms and not the slightly cocoa-tinged ones found in my monster cereal of choice, and the cereal pieces are differently shaped, but they tasted the same or similar enough to the Count-version that I feel validated in calling out this cereal on it's unnecessary-ness. This tastes like Count Chocula with vanilla marshmallows, which is not something I ever wanted or asked for. 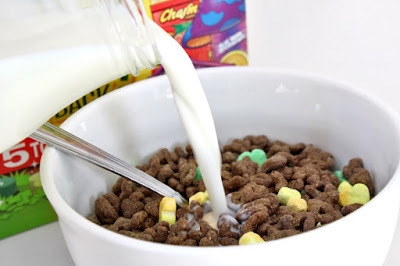 With milk, the cereal does seem to stay crisper longer than your normal sweetened-oat version of Lucky Charms, but the flavor payoff is, again, the same or similar enough to Count Chocula that I want to say that I really don't think this is worthy of being it's own thing. Why not just buy Count Chocula? 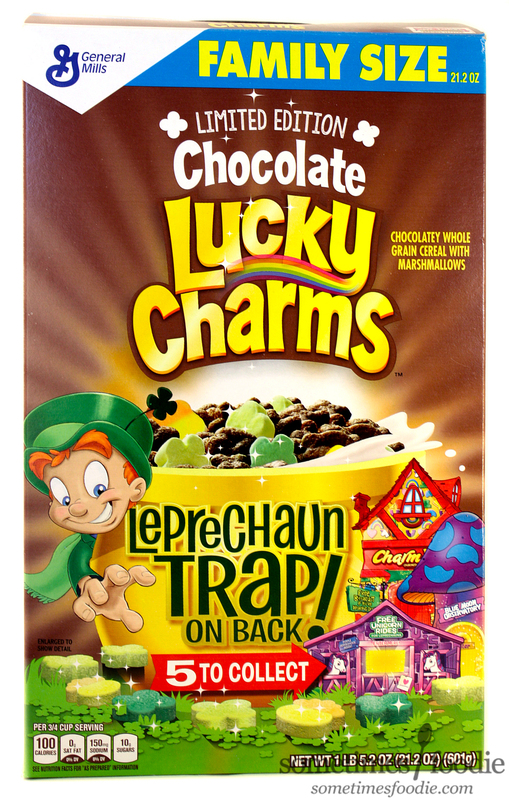 With all the ever-growing cereals with marshmallow-bits on the market, maybe Lucky Charms feels threatened and it's trying to claw it's way out of it's niche and grab people away from other brands, but they aren't going to be doing it with this. Now that Chocolate Frosted Flakes have added them into the mix as well as the seasonal Hot Cocoa Cocoa Puffs, and the year-round presence of the ever spooky (and obviously superior) Count Chocula, I don't think this is a race Lucky Charms is going to win. These are good, they're sweet, stay fairly crunchy in milk, and have a moderate chocolaty-ness, but they aren't unique and they are definitely something I've seen other brands do better. Then again, I'm old(er), and grumpy, and I've been around the cereal block a few times. Fresher eyes, and tastebuds, seem to really enjoy these. My fiance's daughter loved them, decimated the rest of our box, and raved about them to all her friends and her aunt ended up buying them on her recommendation and loving them as well, but this food blogger was unimpressed.